Teacher uses floorstorming as a strategy to activate background knowledge and develop field knowledge of the 1960s in Australia. Students respond to selected images, newspaper headlines and relevant magazine articles in small groups. Each group may have different information. A thinking scaffold may be used to organise ideas about the social and cultural lives of young people in Australia during the 1960s. What do students know of the 1960s in Australia? Teacher leads brainstorm and students categorise information under social, cultural and economic conditions. What vocabulary is associated with this period in Australia in particular? Develop a class vocab list, which students may add to during the unit of work. Discuss the gaps in knowledge and understanding and discuss ways of locating relevant information. Using a newspaper article from the 1960s about a significant event or person in Australia, teacher models specific types of questions that elicit different details and responses about the text. For example, types of questions that when asked, yield factual and descriptive detail, those that elicit explanatory details and opinion and questions that will yield analysis and novel ideas. The SOLO taxonomy is a useful way to help students to categorise levels of thinking in relation to questions to be asked. Using another text that captures a personality or event from the 1960s in Australia the teacher models how to complete a three-level guide on the text. Students develop a range of questions based on prior teacher modelling of question types in reference to the SOLO taxonomy. They develop a survey that uses a range of question types and administer it to family/friends who were adolescents during the 1960s. The survey should ask about the respondent’s knowledge, experience and feelings about a specific event that was important to them in the 1960s. The results of the survey are shared and contribute to the existing brainstorming information. Students discuss the types of responses that their questions yielded. After teacher models the structure and language features of an interpretive response paragraph, students convert the results of their ‘home surveys’ into an interpretive response paragraph that provides one person’s views about an event during the 1960s in Australia. Using a text (supported by images) that captures a personality or event from the 1960s in Australia, the teacher reminds students about selecting relevant information in note-taking and completes a dictagloss activity (page 121) with the class. Students discuss their notes as a class, identifying gaps in their information. Students may extend their notes into a short paragraph that describes, explains and offers a point of view about the text. Teacher models the three interpretive elements of three-level guides (page 118). Students work in pairs or small groups to interpret and respond to a text or image that develops contextual understanding of Australia in the 1960s. What was making news about the time Ivan Southall was writing Ash Road? In particular, question the visibility of adolescents in records from this era. How are they represented? Revisit and add to ideas from the floorstorming activity. Model questions to ask about the selected image that will yield factual information, explanatory information as well as analysis and opinion. Model how to record details effectively in note form and explain the seven strips note-taking (PDF, 70KB) strategy. Using the jigsaw reading strategy (page 94), students explore Australia in the 1960s through a range of selected newspaper clippings, magazines and visual images – one text and one image per group (students might bring suitable family photos from the 1960s for this analysis and response work). They apply a range of question types appropriate for the sources to ensure that they go beyond a literal interpretation of information and images. Teacher models how to record details effectively in note form and explains the seven strips note-taking (PDF, 70KB) strategy. This strategy can be modified so that students select three facts, three related explanatory details and one opinion or synthesis item. It is simply a starting point to help students become more effective and independent at note-taking. In their home groups, students take notes from each other’s presentations. Teacher models writing a short (one paragraph) critical response to a relevant historical source. The response contains elements of fact, opinion and a brief analysis that includes a personal opinion as a summative sentence. In particular the teacher models the language of response texts: how is language used to express fact and personal opinion? How does the writer lend authority to a personal opinion or use their opinion to persuade? Descriptive language use: Clipped used of descriptive language and short sentences to describe setting. Setting is described more in terms of the narrator’s emotional response to conditions. Descriptive language use: Highly descriptive. Long sentence. Setting is described in fervent detail. Effect on the reader: The combination of brief almost factual description of setting is a rather dispassionate description. The details about setting are provided by the more elaborate personal response. This combination creates a sense of foreboding. Effect on the reader: It is almost as if the immediate setting is being scanned and the minute detail is being relayed to the reader as certain features come into view. The writer seems to be encouraging an appreciation of the landscape as well as hinting at the significance that natural features may play in the novel. Given an unseen (relevant to Ash Road) source (verbal and/or visual text) associated with the representation of teenagers in the 1960s, students develop their own questions for the source and write a one paragraph response to the source. Students select a character from one of the three main protagonists introduced in the first chapter of Ash Road and write an interpretive response-style paragraph that describes, explains and offers an opinion about the selected character at this stage of the novel. Students will take notes to develop a profile of their chosen character while reading the novel. Students understand how language features and language patterns can be used for emphasis. They show how specific details can be used to support a point of view. They explain how their choices of language features and images are used. Chapters 2 and 3 introduce other characters and their families. These two chapters introduce the inhabitants living along Ash Road. Personalities as well as social and gender divisions emerge in these chapters at quite a rapid pace. Discuss how the narrator and characters may reflect the personal experience and attitude of Southall. Miss Godwin is the local school mistress. Her life is ordered and purposeful. Miss Godwin participates enthusiastically in the small community. She is appreciated by students and their parents. What does Ivan Southall want the reader to believe about this character? How has the writer used language to build an ‘image’ of this character? Example response: In some ways the writer has produced a stereotypical school teacher or perhaps his ideal school teacher. The reader is led to believe that Miss Godwin is well-respected: she is very measured and orderly in her personal life and she is an enthusiastic participant in community life. The descriptive language complements these aspects of character – it is ‘no-nonsense’ descriptive detail with little embellishment. The description is reasonably detailed and focuses on the character’s actions. There is very little detail about Miss Godwin’s appearance – as if this is unimportant. Ivan Southall received acclaim for his description of the landscape and weather conditions surrounding the Ash Road fire. Biographical information about Ivan Southall reveals that he may have had firsthand experience of bush fires. What features of his setting are realistic, how does he use language to describe the setting? Compare Southall’s descriptions with those from news reports at the time of the 1962 fires. Fierce northerly winds fan bush fires in the Dandenongs. One fire starting in The Basin reaches the One Tree Hill lookout. Late afternoon rain and firebreaks help restrict the fires. afternoon brought to a successful end hard battles by hundreds of firefighters, including military and RAAF personnel. How does the writer present women in the text? What language is used to describe women and which events in particular involved them? In chapters 7 and 8 relationships change and new relationships are forged. Explore the alliance between Mr Fairhall and Harry and Wallace. What prompted the association? How does the writer use language to position the reader to accept the change in relationship? Explore two characters, during a class discussion, who are presented as rather weak, for example Graham or Peter Fairhall. How are they described? What actions do they take and how do they change throughout the novel? How are they perceived by other characters? How does Peter Fairhall redeem himself? How does Graham redeem himself? How does the author use language selectively to build reader perceptions of weak characters? Lead a joint construction of a character response that includes how the writer uses language to position the reader. For example, what sorts of conversations involve ‘weak’ characters? What are the language features of these conversations? As a class discussion, examine a character from a similarly themed work of Ivan Southall’s e.g. Hills End or Josh. Identify the character formula that the writer is using. Teacher models a role play of a character from the text. Students ask the ‘character’ a variety of questions. Emphasis on shifting questions from descriptive/literal to explanation, elaboration, point of view and exploration of theme. In small groups students consider how some of the characters might represent Ivan Southalls’s viewpoint. How has the writer embued some of the characters with overtly desirable and undesirable characteristics? What can be gleaned about the writer’s point of view some of the characters. For example, Mr Fairhall is a wealthy landholder but he didn’t ‘earn’ his property. Peter Fairhall is molly-coddled and arguably of weak character. Working in expert groups students select a character to role play. They make connections between the language the writer uses to describe the character as well as the interactions and conversations associated with the character and the character’s responses to particular events. Students return to their home group ‘in character’ and respond ‘in character’ to questions posed by other group members. Students revisit their selected character from the previous summative task and add another paragraph that provides a critical response to the character describing, explaining and offering an opinion about how the chosen character has changed as a result of events and interactions in the novel. Working individually or in pairs, students examine aspects of a ‘strong’ character from Ash Road and develop a character response which may be written, visual or verbal. Students revisit their selected character from the previous summative task and add another paragraph that provides a critical response to the character describing, explaining and offering an opinion about how the chosen character has changed as a result of events and interactions in the novel. Students compare and analyse information in different texts, explaining literal and implied meanings. They select and use evidence from a text to explain their response to it. Students understand how language features and language patterns can be used for emphasis. They show how specific details can be used to support a point of view. This text is realistic, action-adventure with a certain detail and quality of characterisation and setting that sets the work apart from other texts available for children in the 1960s. The text is structured around a very fast-paced chronological series of events. 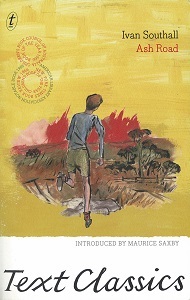 After teacher-modelling of each element and guided practice as a class, students work individually to extract examples of expressive language used, such as an evocative adjective and noun group: ‘the heat was savage and searing and awful to breathe’ (p. 12) or other non-neutral vocabulary used to describe setting, events and characters in Ash Road. Explore the use of verb groups and time shifts in relation to key events in the novel. When considering key events, examine the use of prepositional phrases, adverbs and adverbial clauses used to describe fast-paced events. For example, ‘beating futilely at a widening arc of fire’ (p. 22). Semicolons and compound sentences are used to divide an event from the character’s response, adding detail but maintaining pace. For example, ‘they tried to stamp on the fire, but their feet were bare and they couldn’t find their shoes’ and ‘He couldn’t come to grips with the situation; he knew only dismay and the wildest kind of alarm’ (p. 22). As a class, explore the way the writer has infused characters with his own world views. Does Ivan Southall use the narrator to convey his own ideas and beliefs? Consider how these views are a product of the time in which he was writing. For example: Mr Fairhall to a policeman: ‘It’s been my town for more than forty years. If I want to go right, I go right’ (p. 173) or Grandma Fairhall: ‘Just a fat and nameless old woman . . . but at home she was Gran Fairhall, a women of consequence’ (p. 215). Teacher selects one character from the novel and models ways of extending the dialogue of particular characters based on their personality and response to an event depicted in the text. The language should retain the style of the story as well as identifiable features of characters and describe realistic responses to an event in the novel. Students ‘borrow’ the language that Ivan Southall uses to develop dialogue for a selected character. The dialogues are shared in small groups and peer assessed. With teacher assistance, marking criteria are developed for peer assessment. The dialogues should extend details around a particular event and provide further insight into aspects of character. Establish this scenario with students: the novel is to be converted into a movie and the movie-maker needs to extend some of the characters’ dialogue and interactions. Students are to select a character and give them a more significant role in particular events in the story, while maintaining the essence of the character. They should use language that continues the style and themes of the novel, maintains the pace of events and retains the integrity of a character. Negotiate the criteria for assessment with the students. Criteria should include use of a variety of sentence types, use of evocative adjectives and noun groups, use of expressive verbs and adverbial phrases and clauses. Students understand how language features and language patterns can be used for emphasis. They show how specific details can be used to support a point of view. They explain how their choices of language features and images are used. Bold black line sketches introduce each chapter in Ash Road. The sketches capture something of the events and character responses. Teacher selects one illustration from Ash Road and one from Hills End and models different layers of interpretation (literal, inferential and critical). Make connections with writing in creative arts i.e. personal response to an artwork. Discuss connections between the illustration and the text in both examples. How does the illustration add descriptive detail about people and events, how does the illustration connect with events and setting? Is something introduced in the illustration that is unusual or different from the nature of the chapter it precedes? How has the illustrator captured the essence of a chapter? Using a thinking scaffold, students work in pairs to analyse selected sketches. The notes that students make in the thinking scaffold could be converted into short responses to the illustrations. Students select an illustration and add appropriate dialogue that maintains the integrity and shows connections to events in the text. Students draw an alternative illustration that captures the theme of a chapter and has a logical connection to events. Students jointly construct marking criteria for an effective personal response. They use the criteria to evaluate responses from their peers and to self-assess their response. Students select a chapter and its associated image and write a personal response. By the end of Year 6, students understand how the use of text structures can achieve particular effects. They analyse and explain how language features, images and vocabulary are used by different authors to represent ideas, characters and events. Duration Four to six weeks, approximately one hour a week. The novel should be read in modelled, shared and independent reading sessions outside the time allocated here.